All transactions are safe and secure with a reliable history in online purchasing behind each of our associates. 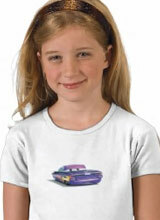 Buy the Cars Ramone t-shirt to own Cars clothing and merchandise. This Disney Pixar Cars Ramone shirt is available in both kids and adult sizes. The front features the trimmed out 1959 Chevrolet Impala Lowrider, complete with the familiar purple paint job and vibrant flames that run down each side. The car is shown with its hydraulics engaged. Voiced by actor Cheech Marin, the character owns Ramone's Paint and Body Art, a vehicle detailing and paint service. To keep his skills sharp while business is slow, Ramone paints himself each morning. Later in the Disney Cars movie, he paints Lightning McQueen. In addition to the Cars Ramone tee above, browse the Cars Clothing Gallery for more apparel like men's and women's clothes, kids shirts or hoodies.